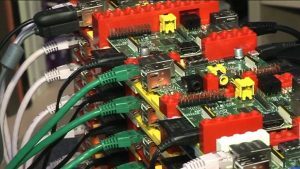 The first time I heard about a computer comprised of multiple Raspberry Pi’s, it was the Southampton University ‘Lego’ Computer. I discovered a blog entry which described a Raspberry Pi cluster built by Nnvidia High Performance Computing Engineer, Adam DeConinck Some technical details about Adam DeConinck’s pi cluster. Due to public demand, they made some details available, including a readme file on github with more information.